SQLSaturday Denver is happening on September 15, 2018. It will be held at Sturm Hall at the University of Denver, located at 2040 S Race St, Denver, CO. Here are three things you’ll want to know so you can plan your day. 1. You can access the schedule on the website at http://www.sqlsaturday.com/774/Sessions/Schedule.aspx or through the Guidebook app. You can also build your schedule online. 2. We are not providing lunch since there are lots of great food options around. There will be 3 food trucks on campus, and there are several restaurants within walking distance. 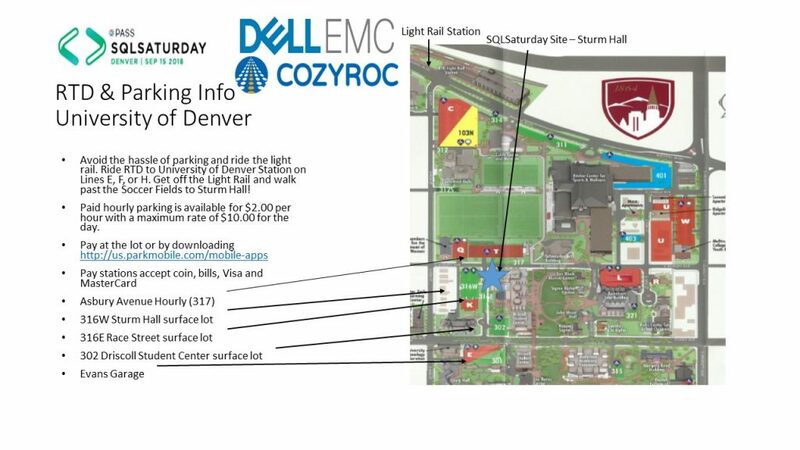 Check out our list of Lunch Options for SQL Saturday or see the map below for the closest options. You can bring your own lunch, grab lunch on campus, or walk to a nearby restaurant with other SQLSaturday attendees. You get 90 minutes for lunch so you shouldn’t have to rush. 3. Plan your transportation and parking in advance so you don’t have to spend a lot of time looking for a spot to park. 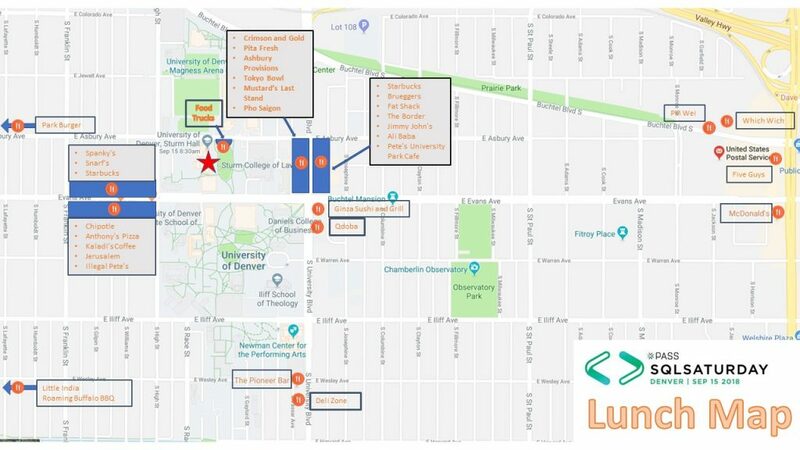 There is a light rail station near DU, so you can skip the parking hassles. There are also surface lots and a parking garage on campus not too far away from Sturm Hall where we are having the event. Check out your options in the map below or see the full map here. If you haven’t yet registered for SQLSaturday, you can go to SQLSaturday.com/774 and do that now. We hope to see you there!